As a friendly reminder, the deadline for Christmas delivery is Wednesday, December 13th. All orders received by the 13th will be shipped by Saturday, December 16th. Orders received after 12/13 will be processed under the normal shipping timeline of 3-7 business days. Our holiday sale continues through Christmas Day. 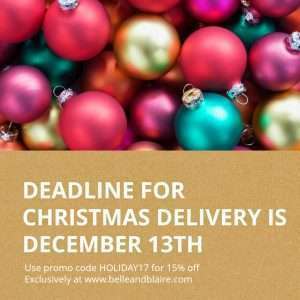 Enter coupon code HOLIDAY17 at checkout to apply the 15% off discount on your total order at BELLEANDBLAIRE.COM.